An accurate diagnosis and early detection of epithelial pathologies is not only essential for appropriate treatment planning but also vital for determination of prognosis. 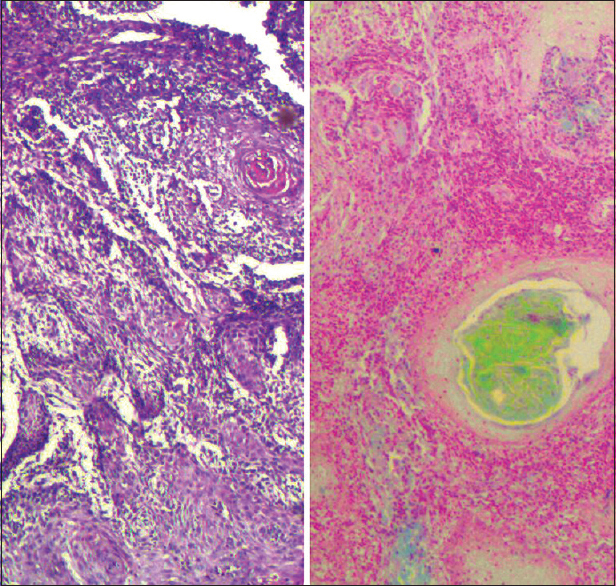 Although molecular biology is being increasingly used in the investigation of oral squamous cell carcinoma (OSCC), histological examination of formalin-fixed paraffin embedded tissues stained with hematoxylin and eosin (H and E) remains the cornerstone of contemporary cancer diagnosis and pathological staging in routine practice. H and E stains have been employed in histopathology since the mid-1800s. The stain works well with numerous fixatives and moreover shows a wide range of cytoplasmic, nuclear, and extracellular matrix features. As such, it is considered the standard technique among pathologists since its inception. Hematoxylin takes a deep blue-purple and stains the nucleus and nucleic acids primarily. Eosin is pink and stains basic proteins and cytoplasm. The nuclei show varying cell-type and cancer-type specific patterns of heterochromatin condensation, which is well appreciated under hematoxylin stain that is of diagnostic significance. In this context, an appropriate differential stain capable of distinguishing epithelial cells in the connective tissue may well prove to be a valuable aid. In the present study, we endeavor to use Cajal's trichrome stain for making diagnosis easier without resorting to expensive diagnostic aids. The Cajal's trichrome was initially described by Ramon Y Cajal in 1897. It is a good stain for tissues composed of different structural components and as such is applicable in cases with connective tissue framework associated with epithelial cells. 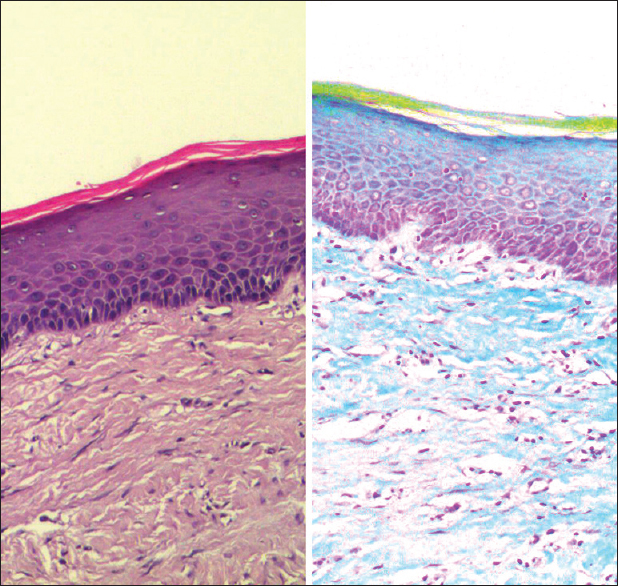 In SCC, it gives different tonalities of colors for varying degrees of keratinization and cellular differentiation. To assess both the epithelial and connective tissue elements in normal oral epithelium, oral epithelial dysplasia, and oral carcinoma in tissue sections stained with modified Cajal's trichrome stain and to compare it with H and E-stained sections. All cases of oral epithelial dysplasia and OSCC in the archives of the Department of Oral Pathology and Microbiology were reviewed, and 10 cases each of diagnostically challenging epithelial dysplasia and carcinoma were selected. Dysplasia was classified as mild, moderate, or severe following the WHO tumor classification (Gale et al., 2005). OSCC was chosen based on depth of invasion, i.e. micro-invasive and frankly invasive. 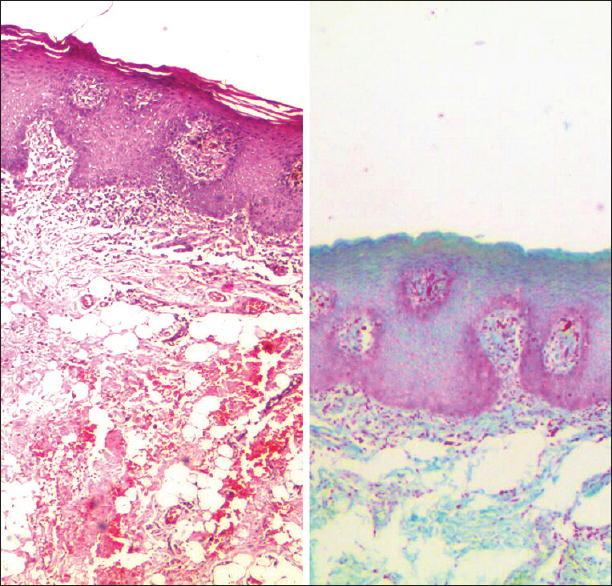 Formalin-fixed, paraffin-embedded tissue blocks of mild epithelial dysplasia (n = 2), moderate epithelial dysplasia (n = 2), severe epithelial dysplasia (n = 4), carcinoma in situ (n = 1), micro-invasive SCC (n = 4), verrucous carcinoma (n = 1), and frank OSCC (n = 5) were retrieved from the archives. As controls, normal oral epithelium (n = 10) were carefully chosen based on no history of alcohol or tobacco use., These tissues were fixed in 10% formalin and subjected to routine tissue processing. Two sections each of 4-μm thickness were cut from cases and control blocks. These were subsequently stained with H and E as well as modified Cajal's trichrome stain. Ziehl's acetic fuchsin is a low molecular weight dye which stains all the structural elements dark pink. The differentiation with formol acetic acid removes the stain color from most tissue elements, and only the acidic tissues (e.g., nuclei) retain fuchsin color. With the counterstain, picroindigocarmine, the basic tissues take up blue while the more acidic tissues become progressively green. Only the nucleus retains fuchsin color by the process of “viro-fixation” using formol acetic acid. Gallego modified the original Cajal technique by introducing acetic acid as the differentiating fluid and formaldehyde as a “viro-fixing fluid.” It was seen that the sections stained with basic fuchsin, and passed through diluted formalin, retained the fuchsin stain strongly in their nuclei. This method has the advantage over the original Cajal method in that the nuclear stain is permanent after the sections are treated by formaldehyde; the differentiation is perfected by the addition of acetic acid to the fuchsin and formalin. The alcohol completes the differentiation and dehydration but does not decolorize the nuclei. The sections are then to be dehydrated, cleared, and mounted. The H and E and modified Cajal's trichrome-stained sections were compared based on the following criteria: (1) cytoplasmic details, (2) nuclear details, (3) cell stratification, (4) dysplasia grading, (5) dysplasia screening, (6) depth of invasion, (7) differentiation of epithelial and connective tissue elements, (8) ease of use, (9) economics. Cajal's trichrome stain is a good differential stain capable of identifying epithelial cells in connective tissue stroma. With Cajal's trichrome stain, nuclei stained red, epithelial cytoplasm pink-green, collagen fibers blue, muscle olive green, and keratin and red blood cells grass green [Figure 1]. 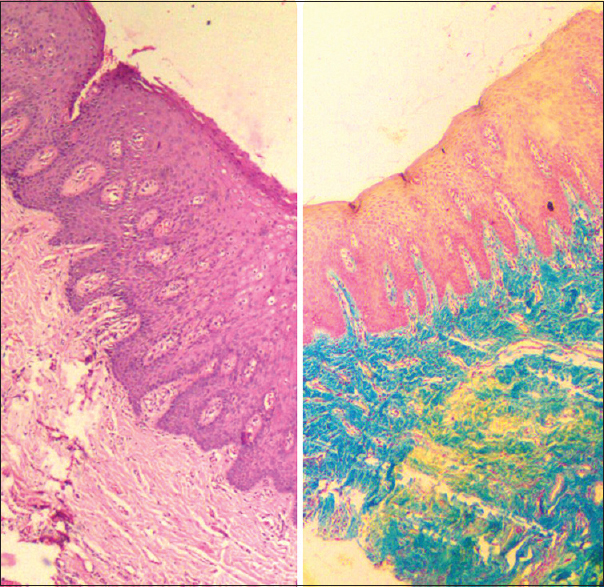 Cajal's trichrome stain helped delineate moderate [Figure 2] and severe dysplasia [Figure 3] more clearly than H and E stain. 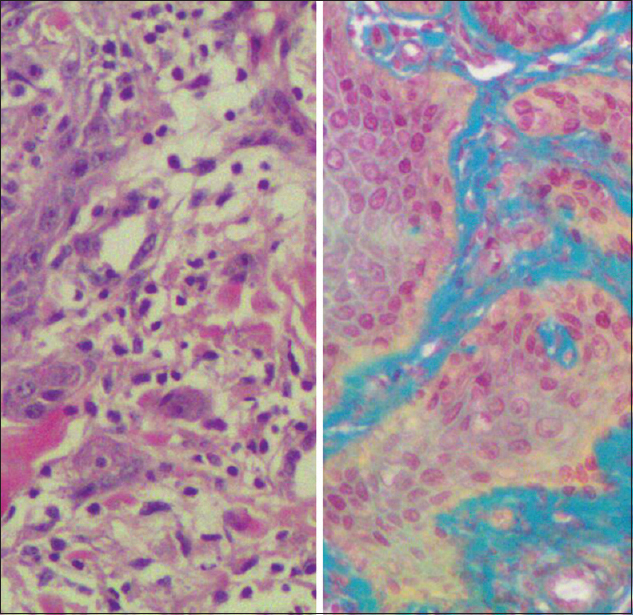 In SCC cases stained with Cajal's trichrome stain, invasion of tumor cells into connective tissue [Figure 4] and the presence of keratin pearls were strikingly evident [Figure 5]. Depth of invasion could also be more accurately determined by this method as the exact extent of tumor is accurately analogized. 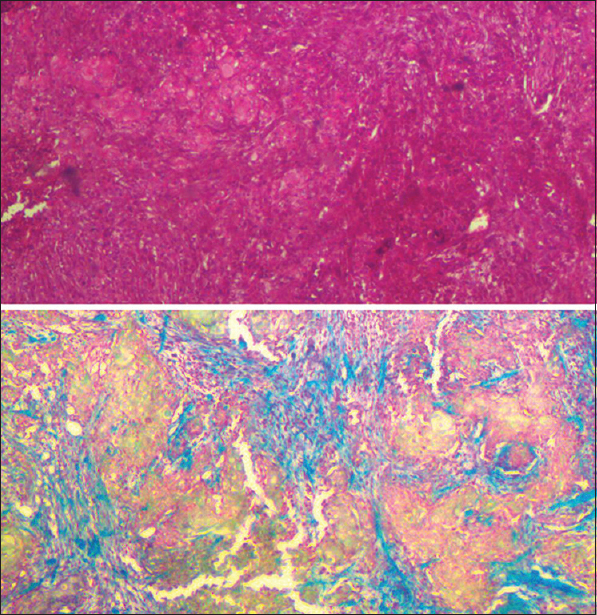 Tumor cells of SCC in the lymph node were intensely contrasted and easily discernable compared to H and E-stained sections [Figure 6]. The infiltration of malignant cells in the lymph node was seen to more extensive than observed under H and E staining, thus providing an accurate picture of tumor invasion in the lymph node as the epithelial cells were readily identifiable [Figure 7]. 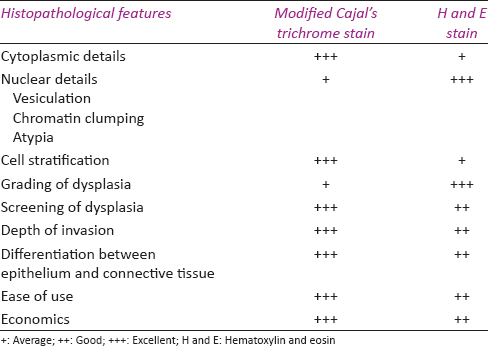 The results showing the comparison between modified Cajal's trichrome stain and H and E stain have been summarized in [Table 1]. In such cases, we found that the modified Cajal's trichrome provides remarkable differentiation between epithelial and connective tissue elements. We also noted that cytoplasm stained predominantly green in dysplastic epithelium while normal epithelium showed primarily pale pink cytoplasm. However, nuclear features such as vesiculation, heterochromatin condensation, and atypia were better discernable with conventional H and E stain. Thus, we noted that grading of dysplasia can be done more accurately with H and E whereas Cajal's trichrome stain will be helpful in screening of large samples. The trichrome stain of Cajal which was initially described by Cajal and later modified by Calleja and Gallego is rarely used in the histopathology laboratory. We found the modification by Gallego yielded good results with few adjustments in staining time. The review of trichrome stains by Castroveijo (1932) which emphasized on the Cajal trichrome stains has described the various staining techniques and principles extensively. He has also reported that this stain is one of the best for diagnosis of tumors such as neurofibroma, myofibroma, and fibrosarcoma. The author also noted that in his experience, it was one of the best stains for the study of corneal pathology. He further elucidated that this stain is particularly useful in tumors where connective tissue framework is associated with epithelial cells and shows variation in hues with degree of keratinization. This was the basis for our hypothesis that this stain will be particularly useful in the diagnosis of early micro-invasive SCC. An excellent review on Aberlado Gallego and his contributions to histotechnology by Ortiz-Hidalgo (2011) has discussed Gallego's general connective tissue stain as one of the stains perpetuated by Gallego. The protocol mentioned bears remarkable similarity to the Cajal's stain, except for the substitution of indigocarmine by indigo as the counterstain in the former. It has been noted that the general differentiation of tissue elements with this stain is striking and can be used in histology teaching. An extensive Google Scholar and PubMed search did not reveal any other studies done using the Cajal trichrome stain in the digital archives. Indeed, as mentioned by Castroviejo, though the silver impregnation methods developed by Cajal are quite popular, the triple stain developed by him is hardly known and practiced despite being one of the best differential stains. By establishing Cajal's trichrome as an adjunctive histopathology stain, possible shortcomings in cancer diagnosis can be overcome. The Cajal's trichrome stain may be a potential savior in scenarios requiring screening of large samples of potentially malignant or malignant lesions and in special cases where the invasive nature of the tumor is not readily discernable. Although H and E remains the gold standard for pathological analysis, Cajal's trichrome may well prove to be a valuable addition to a pathologist's armamentarium. We would like to acknowledge Mrs. Anitha Dorothy, BSc, DMLT, Senior Technician, at Vydehi Institute of Dental Sciences for the technical support. Woolgar JA, Triantafyllou A. Pitfalls and procedures in the histopathological diagnosis of oral and oropharyngeal squamous cell carcinoma and a review of the role of pathology in prognosis. Oral Oncol 2009;45:361-85. Fischer AH, Jacobson KA, Rose J, Zeller R. Hematoxylin and eosin staining of tissueand cell sections. Cold Spring Harbor Protocols. 2008 May;3(5). Bolesina N, Femopase FL, López de Blanc SA, Morelatto RA and Olmos MA (2012). Oral Squamous Cell Carcinoma Clinical Aspects, Oral Cancer, Dr. Kalu U. E. Ogbureke (Ed. ), InTech, DOI: 10.5772/32968. Available from: https://cdn.intechopen.com/pdfs-wm/31751.pdf. [Last acessed on 2017 Aug 13]. Shankar AA, Gokul S. The dilemma of microinvasion. Head Neck Oncol 2014;6:30. Culling CF, Allison RT. Cellular Pathology Technique. 4th ed. London: Butterworth Pub. ; 1985. Bancroft JD, Gamble M, editors. Theory and practice of histological techniques. Elsevier Health Sciences; 2008. Álvarez ME, Jiménez-Gómez R, Ardila MC. Immunoexpression of P53 in oral squamous cell carcinoma and oral dysplastic lesions in patients with the habit of reverse smoke. Int J Odontostomatol 2013;7:185-91. 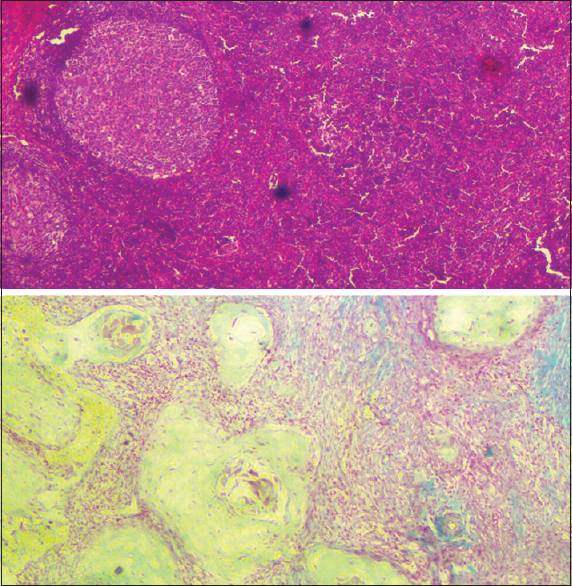 Gale N, Pilch BZ, Sidransky D. Epithelial precursor lesions. In: Barnes L, Evenson J, Reichart P, Sidransky D, editors. World Health Organization Classification of Tumours. Pathology and Genetics of Head and Neck Tumours. Lyon: IARC Press; 2005. p. 177-9. Barnes L, Eveson JW, Reichart P, Sidransky D, editors. World Health Organization Classification of Tumours. Pathology and Genetics. Head and Neck Tumours. Lyon: IARC Press; 2005. Pentenero M, Navone R, Motta F, Marino R, Gassino L, Broccoletti R, et al. Clinical features of microinvasive stage I oral carcinoma. Oral Dis 2011;17:298-303. Burnett D, Crocker J. The Science of Laboratory Diagnosis. 2nd ed. Philadelphia: Wiley Pub. ; 2005. Ortiz-Hidalgo C. Abelardo Gallego (1879-1930) and his contributions to histotechnology: The Gallego stains. Acta Histochem 2011;113:189-93. Woolgar JA, Triantafyllou A. A histopathological appraisal of surgical margins in oral and oropharyngeal cancer resection specimens. Oral Oncol 2005;41:1034-43. Cardesa A, Gale N, Nadal A, Zidar N. Squamous cell carcinoma. In: Barnes L, Eveson JW, Reichart P, Sidransky D, editors. World Health Organization Classification of Tumours. Pathology & Genetics. Head and Neck Tumours. Lyon: IARC Press; 2005. p. 119-23.